Sooni Pouch box is $35.99 and includes 8 full-size or deluxe sample size products with a promised value of over $100. Sooni Mini Pouch is $19.99 and includes 3-4 full-size or deluxe sample size products with a promised value of over $60. Sooni Mask Pouch is $9.99 and includes 6-8 sheet masks with a promised value of over $30. This is a review of the Sooni Mini Pouch, $19.99 a month, box. COUPON: Use code FAMILY to save 10% off your first box! I couldn’t find much information online about this product, and that is a shame because I really liked it. It has SPF 50 as well as protection from UVA rays. Even though it is some heavy duty sun protection, it felt like I was applying a moisturizer to my face- it sank in quickly, didn’t have a sunscreen scent, and didn’t leave my skin greasy. I was pretty hesitant to try out this shampoo when I couldn’t find it readily available online, but I decided to go for it- and I am happy I did! This didn’t dry my hair out at all, left it soft, and my curls and scalp felt healthier after using. This was a solid makeup remover! I don’t typically use waterproof makeup, but this removed my lipstick and eye makeup with ease without damaging my eyelashes. Hello, pricy skincare! These are definitely the fanciest foil samples I have yet to receive from Sooni Pouch – and they’re from the well-known brand “History of Whoo,” which was inspired by the traditional Korean royal culture. This anti-aging moisturizer is made with red ginseng extract and Korean herbs, and while the two foil samples aren’t enough to see a difference in my skin, this had a luxurious texture that sank in quickly. Also, check out how beautiful the full-size packaging is! This cleanser is made with the traditional Korean herbs to brighten skin while effectively cleansing, and it has a whipped texture that felt great on my skin. Again, two uses aren’t enough to convince me I need to drop the big bucks, but I felt fancy while using them. This sheet mask is made with berry extracts like strawberry, blueberry, and cranberry, along with tomato extract and lavender. This was soothing to my skin, didn’t have a discernable scent, and left it feeling hydrated. This sheet mask is made with Hawaiian seawater and is designed to provide maximum moisture to your skin. The mask had some stretch and fit my face well, and I was impressed with the good ingredients list. My skin definitely felt like it consumed a tall drink of water after using this. The Verdict: I am very pleased with my Sooni Mini Pouch this month! I thought all of the items sent were high-quality, and I appreciated that even the foil samples (which are a regular occurrence in this box) were from a well-known luxe brand. I still wish Sooni Pouch would include more information on their info sheet since so many of the products are hard to find and have Korean-only product packaging, but part of the fun of this subscription is trying brand new K-Beauty products, and I think they delivered that. This box is supposed to include 3-4 full-size or deluxe size samples with a retail value of over $60. Considering how impressed I was with the performance of the sunscreen, I wouldn’t be surprised to see it have a high value. Either way, however, I definitely think I got my monies worth for the $19.99 cost. Can you get this box if you sign up today? Yes, I believe February boxes are still shipping. 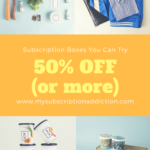 Coupon – Use code FAMILY to save 10% off your first box! Value Breakdown: This box costs $19.99 + free US shipping, which means that each of the 7 items (counting each foil sample set as one) in the box has an average cost of $2.85. Check out all of our Sooni Pouch reviews and the K-Beauty Subscription Box List for similar boxes! What do you think of the Sooni Pouch? What is your favorite K-Beauty product discovery? This box was sent at no cost for review, but I try to look at every box as if I personally paid for it when I am examining values. Hope that makes sense!